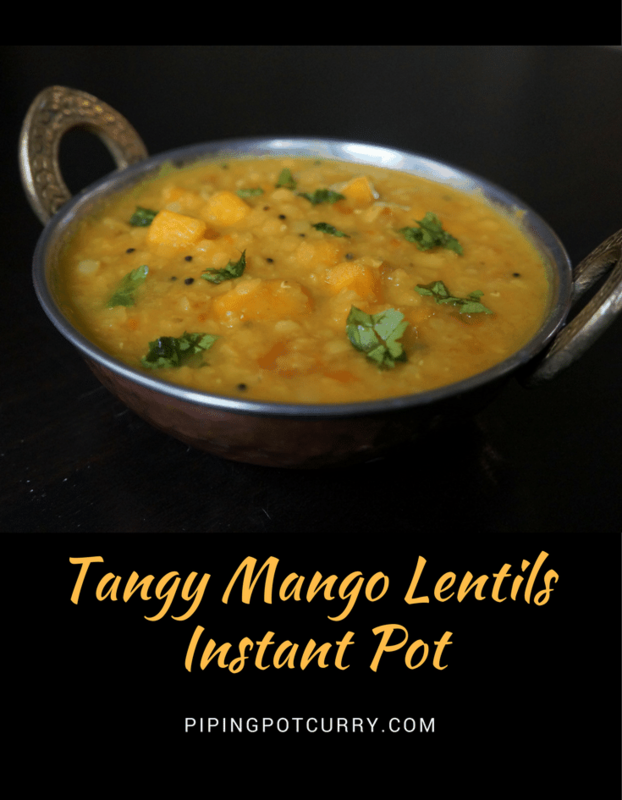 An interesting mixture of sweet, tangy and spicy flavors – MANGO DAL in the instant pot. Toor dal (Split Pigeon Pea) cooked with raw mango and tempered with red chillies, curry leaves, mustard seeds and spices. 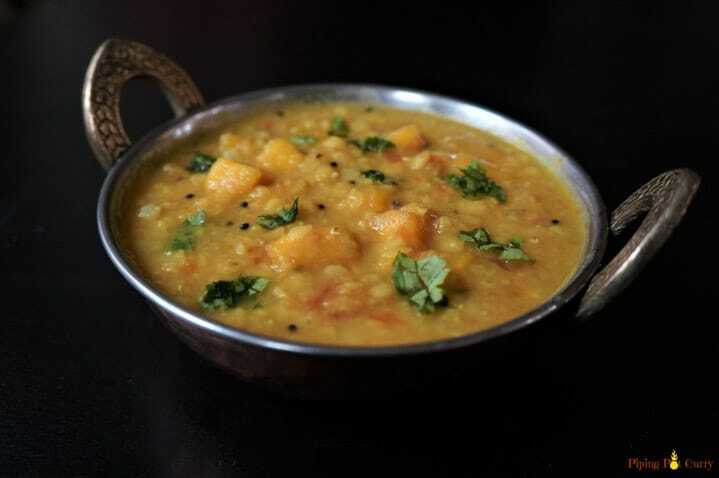 This dal is also called Mango Pappu or Mamidikaya Pappu in South India, where pappu means lentils. Being a North Indian, I had never had a fruit in my lentils. I was not sure I will like the sweet or tangy fruit flavor in my savory spicy lentils. 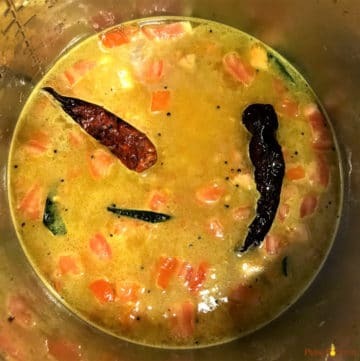 However many people were posting recipes for mango dal in the Instant pot for Indian Cooking facebook group. Hence I decided to give it a try. It was really tasty, with an interesting flavor of mangoes along with lentils. In a single spoon, you can taste the lentils and the tangy sweet mangoes. I found this to be a great variation to the everyday lentils. 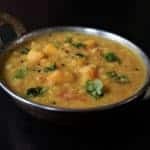 Mango dal goes well with basmati white rice or brown rice. You could also have it as a soup. 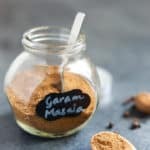 You might also like other lentil recipes made in the pressure cooker – Spinach Dal, Dal Makhani, Vegetable Sambar or Dal Tadka. Start with heating oil or ghee in the instant pot insert on sauté mode. Then add mustard seeds, red whole chilies and curry leaves. Let the mustard seeds pop, as that helps to bring out the flavor and aroma. Then saute the onions, tomatoes and spices. Now add the washed lentils and pressure cook for 3 minutes. The reason we are cooking for less time is that we are going to give this another boil after adding the mangoes. 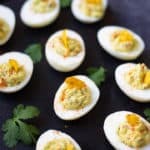 Do a quick release and add in the cut mango pieces. Simmer for 2 minutes until the dal comes to a boil. 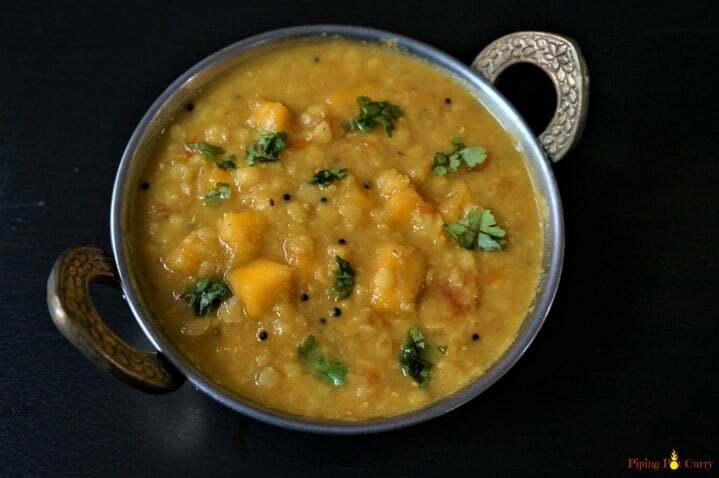 You can make Mango Dal with ripe or unripe mangoes. I used ripe mangoes which were more sweet than tangy. 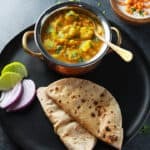 If you are using unripe mangoes, add before pressure cooking the dal and pressure cook for 5 minutes, as they take longer to get soft. The taste would also be more tangy with unripe mangoes. Garnish with cilantro and Mango Dal is ready to be served with basmati rice. One variation for this dal is to add chopped spinach when you add the mangoes, which makes it more nutritious. Another variation is to add other fruits such as apple or how about some squash. 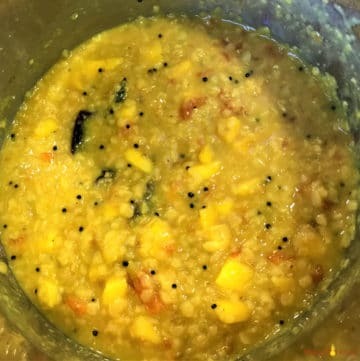 Try this Mango Dal and let me know how it turned out. Leave a comment below. 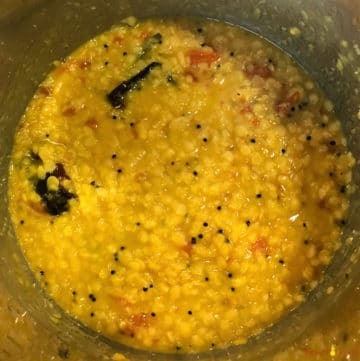 Toor dal (Split Pigeon Pea) cooked with raw mango and tempered with red chilies, curry leaves, mustard seeds and spices. 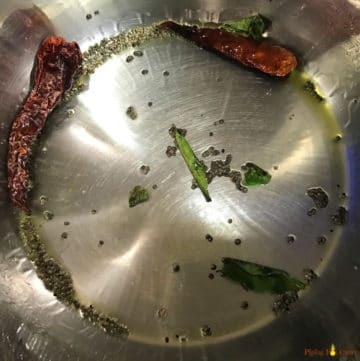 Start the instant pot in saute mode and heat oil in it. Add mustard seeds, red chili whole and curry leaves. When the mustard seeds start to splutter, add chopped onion and saute for 2 minutes. Add tomatoes, salt, turmeric powder and cayenne. Open the lid and add mango pieces. Simmer for 2 minutes until the dal starts boiling. Garnish with cilantro and Mango Dal is ready to be served. I suggest to add mango to the lentils you will use up within the day. 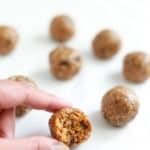 Storing lentils with mango added will change the flavor. It is okay to cook the lentils to refrigerate, and add mango when you are ready to consume it. If using unripe mango, then add it along with the lentils when pressure cooking. Increase the pressure cook time to 5 mins and no simmering required later. Hi! 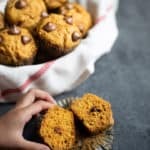 loving your recipes. I would like to substitute Butternut Squash with this lentil recipe. Figured its a good way to sneak in some veggies for my toddler 🙂 Do you think I should add the butternut squash when I pressure cook the dal or Add it afterwards when the dal simmers? Does the timing change at all. Thanks so much! I had never made dal with mangos before either, the tangy fruity flavor is a great change of pace. And so easy, too! I will be keeping this one in the rotation for sure. This was a great change for our always spiced lentils palate as well. Thanks again for sharing back ??? ?